*The Lo40K39d transmitter was the back-up high-frequency transmitter used by type VII/C, type IX, and type XXI U-boats. Other vessels used it as well. 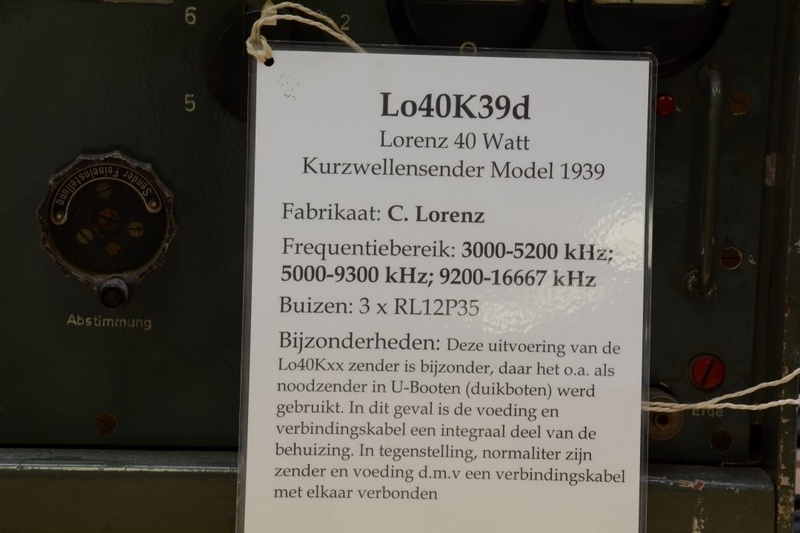 *The "Lo" indicates that it was built by the Lorenz company. *The "40" means that the unit has 40 watts maximum transmitting power. The "K" means that this is a shortwave transmitter. *The "39" indicates that the radio was accepted into the German naval service in 1939. *The "d" means that the a, b, and c models came out previously. *Is your Dutch rather poor? That's OK. My technical editor, Dieter, will come to our rescue, again. All of the information on the plastic card is included in the picture captions for this radio. Photo by permission of the Stg.C.D.V.&.T.